Come to our Annual BBQ Picnic! Your ticket gives you access to all the food at the BBQ. It also helps to cover the cost of registration and materials incurred by hosting a booth at the Boston Pride Festival. We are a volunteer-run organization and we rely on your generosity and participation to sustain operations. 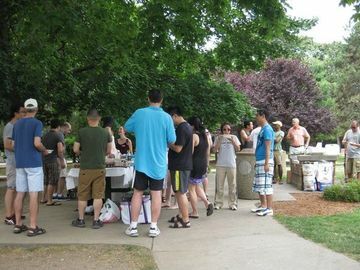 The Annual BBQ is by far our largest event, because of you! Come, have a good time, meet some new people, eat some tasty food and help us raise some funds to help cover the cost of being out, proud and Asian in Boston! Please reserve your ticket ahead of time, $20 online (via meetup) / $25 day of. On the day of, you can pay with cash, check, or even with credit/debit cards! Please let us know if funds are an issue by emailing us at qapa@qapa.org for a sliding scale. This event is the main fundraiser QAPA holds, but we would love as many people to come as possible. Arsenal Park is accessible via the 70 Bus route which passes through Central Square, by the T station. We will also be organizing car pool on Meetup. QAPA is committed to providing a supportive social, political, and educational environment for lesbian, gay, bisexual, transgender, and questioning people of Asian and Pacific Islander heritage in the Boston and New England area.